successfully provide adequate relief and may only provide limited mobility after the procedure. For these patients, a reverse total shoulder replacement can be a viable treatment option. Conventional shoulder replacement devices are designed to mirror the anatomic structure of a healthy shoulder. A metal ball is affixed to the upper arm to fit into a plastic cup on the socket of the shoulder, thus forming the original cup-and-ball joint of the shoulder. 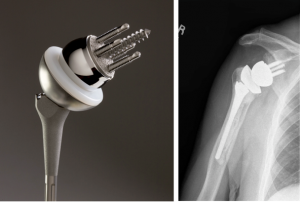 A reverse total shoulder replacement switches these around, putting a metal ball onto the shoulder and attaching a plastic cup to the end of the upper arm bone. ent range. Conventional replacement devices also use these muscles. Patients with damaged rotator cuffs will not be able to use these muscles to move the arm well, resulting in a loss of function and pain while moving the arm. To circumvent this, a reverse total shoulder replacement with a Phoenix orthopedic surgeon uses the deltoid muscles to move the arm instead. The rotator cuff is not used for power anymore, providing relief to those patients with a damaged cuff. Who is Eligible for a Reverse Total Shoulder Replacement? Eligible patients typically only have a reverse total shoulder replacement suggested to them after other treatment methods have been exhausted. The most common condition found in patients eligible for this treatment is significant cuff tear arthropathy. 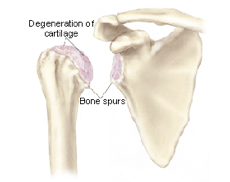 Those with a rotator cuff that has been torn completely and diagnosed as non-repairable may also benefit from this procedure. Patients who have had a previous shoulder replacement end in failure may also be eligible for this procedure. Patients who currently have significantshoulder pain combined with difficulty in moving the arm can potentially benefit from a reverse replacement. Patients will be sedated throughout the entire procedure, with the installation of the artificial devices taking approximately two hours. Once sedated, an incision will be made into either the top or the front of the shoulder, where the damaged bone will be removed and replaced with the new artificial components. Following the surgery, patients are generally kept for a day or so to monitor the results. Patients will be given antibiotics and pain medication to keep them comfortable during this time. After being discharged from the hospital, patients will have a period where they are not able to make full use of the shoulder. During this time, patients will be asked to perform gentle range of motion exercises to improve arm strength. Patients are usually able to achieve usefulness of the arm and return to normal activity after a few months.